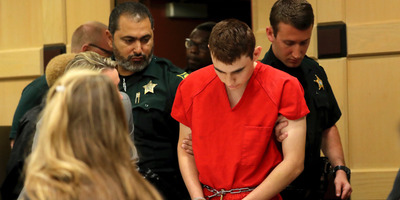 South Florida Sun-Sentinel via Associated PressNikolas Cruz appears in court for a status hearing before Broward Circuit Judge Elizabeth Scherer Monday, Feb. 19, 2018, in Fort Lauderdale, Fla. Prosecutors will seek the death penalty for suspected Florida shooter Nikolas Cruz. The Broward State Attorney filed a notice of intent on Tuesday. Cruz will be formally arraigned on Wednesday. He faces 34 charges, including 17 counts of first-degree murder. Florida prosecutors will seek the death penalty for Nikolas Cruz, the 19-year-old man accused of killing 17 people at a Florida high school last month, according to a notice of intent filed by Broward State Attorney Michael Satz. A grand jury indicted Cruz on 34 counts, including 17 counts of first-degree murder and 17 counts of attempted first-degree murder. He has been held in the Broward County Jail without bond since the February 14 massacre at Marjory Stoneman Douglas high school in Parkland. Cruz is set to be formally arraigned on Wednesday. His defence attorneys had tried to prevent a death-penalty trial by bargaining with prosecutors for a life sentence in exchange for Cruz’s guilty plea. Gordon Weekes, the Chief Assistant Public Defender, told the South Florida Sun-Sentinel that Cruz and his defence attorneys are still prepared to make a plea deal. “We are still ready to enter a plea of ‘guilty’ to several consecutive life sentences, without parole, out of respect for the victims of this tragedy,” Weekes said. Cruz’s attorneys withdrew his not guilty plea on Friday, and Cruz now “stands mute” to the charges. Standing mute has the same legal effect as pleading not guilty, but in Cruz’s case could be part of a legal strategy as his attorneys prepare for the death-penalty trial. But standing mute neither denies nor confirms the allegations, and allows his defence attorneys to proceed without appearing to disrespect the victims.